If you have been injured or have lost a family member because of another person's negligent conduct, you may also have the right to recover compensation for lost wages, medical bills, pain and suffering, and certain other expenses. Our lawyers can help. Although most personal injury claims result from street or highway accidents and negligence such as failing to yield the right of way, speeding, or driving while intoxicated—there are many other ways in which a person or a business can be negligent. A property owner can be found negligent for failing to properly maintain their property. 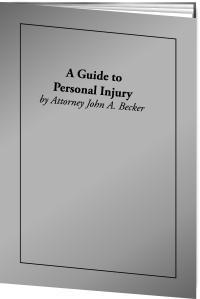 An owner of a dog is considered to be negligent per se if the dog injures another person. Many on-the-job injuries are the result of intentional safety violations by employers. The list is virtually endless. After such an accident, it is easy to become overwhelmed by how much life has changed overnight and the new demands of the circumstances you have been forced into. Insurance companies are aware of this too and may try to make you a quick settlement offer that is not in your long-term best interests. Resist the temptation to accept such an offer until you have spoken with a lawyer. Our attorneys will use their experience and dedication combined with the expertise of medical doctors, professional investigators, and other specialists to build the kind of strong personal injury case that makes insurance companies rethink their strategies and often results in fair, negotiated settlements without the time, expense, and stress of a trial. For a free consultation with an experienced lawyer and an honest evaluation of your case—call us today at (262) 633-7530 or contact our Racine, Wisconsin law offices with a brief description of your situation.